Let's start this month's episode with a drum roll ... a fanfare ... a banner headline ... THE WOODBLOCKS ARRIVE! It was actually good timing, as just before the blocks showed up, I had finally been able to make progress on the hanshita preparation. 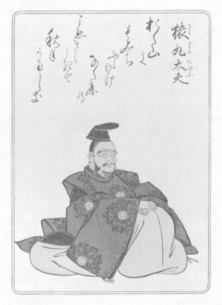 Using one of the tiny negatives I had previously obtained through the Toyo Bunko, I had ordered a woodblock print-size colour photo enlargement of the Ono no Komachi print. When it arrived, I was able to work out a way to photocopy it onto super-thin paper (the process I described in the first issue of this newsletter). I filled in missing details by hand with a fine tip pen, and thus obtained a carveable image. It wasn't very good, because as the negative was so small the photograph was very blurry, but it would have to do. I was on my way! One day during all this carving work, Michiyo and I dropped in on Shimano-san, to pay him for the wood and discuss future supplies. (It was on this trip that we first 'bumped' into Kaneko Shoten, the bamboo skin supplier, about whom I wrote in the last issue). Shimano-san assured me that he would be able to send blocks much more regularly, and that he would support my project as well as he could. And indeed, right to this day, he has never failed to deliver whatever blocks I have asked for each month, no matter how busy with other orders he has been. I feel embarrassed to think of how much overtime he has probably spent getting my wood ready. Of all the craftsmen who have helped me, my debt to Shimano-san is the greatest. One way that I try to pay him back a bit is to send him a complimentary copy of each print as it is finished (I do the same to Yamaguchi-san and Matsuzaki-san). I knew that to these professionals, my work was not so attractive, but I wanted them to see the end product of their efforts, and especially I wanted them to see month-by-month, how the prints were going to improve. I was not so wrapped up in the carving work that I ignored other aspects of the project. Using a photograph that Michiyo had taken of me while I was making test prints of Tenji Tenno, I made up a short one page promotional piece describing my activities, and sent it off to about a dozen newspapers, both Japanese and English. (I kept a copy of that little flyer in my files, and reading it now, I see that it actually says that I was making a set of 100 prints. So it seems that it was sometime between completing Tenji Tenno and the end of carving on Ono no Komachi, that I had decided to 'go for it'). What was I expecting the newspapers to do with my information? I'm not sure, but I just knew that I had to try something. If I simply sat quietly at my bench working, I would certainly be able to make prints, but that wouldn't be enough to pay the rent. I needed to attract some attention somehow. So now, instead of waiting for blocks, I was waiting for the telephone to ring .... How long would this take? 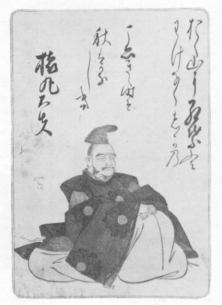 Books in the Edo era were of course printed from carved woodblocks, and indeed there was no difference at all in the basic technology used to produce books and that which was used to make single sheet prints. If it should happen that the publisher sold out the original print run of a book and wanted more copies, he would simply ask his printers to produce them by re-using the original blocks, which would have been carefully stored. Now the final page of most books carried information on the artist, publisher, date of publication, etc., and this information was of course carved on the block for that page. When it came time for more copies to be printed, it was certainly not usually considered worth spending the time to 'fix' that block to change the date, and it is thus sometimes next to impossible to ascertain exactly when any given copy of a book was actually printed. Shunsho's book was apparently re-printed many times, as copies with quite varied colour schemes are known to exist, but they all carry exactly the same date. The 'Shunsho calligraphy' edition is exceedingly rare, leading us to guess that it was perhaps only printed once. Copies of the other editions pop up quite frequently in rare bookstores, usually in quite poor condition, and it seems that there must have been frequent re-printings. (There is a very nice copy currently available in a bookshop here in Tokyo, for 'only' 780,000 yen, should any of you have a hankering for a 'real' original). What finally happened to all those original blocks? Here's three guesses (in order of descending probability): Guess #1) Business was still good, and there was no reason to destroy the blocks, but one of Edo's frequent fires and/or earthquakes finished them off. Guess #2) After many editions were printed from them over a period of years, sales finally fell below the point at which it was worthwhile printing any more copies, and the blocks were either used for firewood, or perhaps re-planed for use in making newer designs (if they were thick enough). Guess #3) Business was very very good, and the blocks were used so many times to print so many copies that they became in the end just too worn to use any more, and were discarded. It is highly unlikely that we will ever discover what happened to them. Of course this all makes me wonder sometimes what will happen to the blocks that I am carving. I sure hate to think of them being destroyed, but I suppose everything turns to dust in time ... At least I hope it'll be after my time! The hawks sail by high above the old farmhouse, but nobody is there to watch them pass. The wind rustles the tree branches on the mountainside, but nobody is there to feel its cooling caress. The cold, clear stream leaps from stone to stone on its way through the valley to the distant sea, but nobody is there to hear its rippling passage. 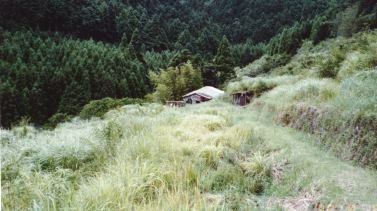 Okunono, our old family farm, is deserted now. The grass stands waist high along the footpaths, the fences lean every which way, the rice paddies and vegetable gardens are thick masses of tall weeds and wild plants of every description, and the footprints of the wild pigs are everywhere. It has been so now for five years ... five years since the old folks finally gave up the hopeless fight against advancing age and advancing nature, and moved down to the city to live with their children, a generation who have rejected life here on this mountain. The wild pigs were waiting for that moment. They had been waiting for a very, very long time. It was many hundreds of years ago that one of grandfather's predecessors first made his way up this valley, looking for places where the mountains relaxed their steepness enough to allow cultivation. He must have thrust a stick into the ground here and turned up the rich earth, and decided that he need search no further ... Every remote village and farm in Japan claims to have been settled by members of the Heike clan, fleeing from their lost battles, but here it is true. It must be true. Their voices can be heard in the night wind, and their lights flicker near the old shrine on the mountainside above the farm, the one surrounded by the towering cedar trees they planted to protect it. How hard those men worked! They dug water channels, shaped timbers for their homes, and hauled the thousands of stones needed to build the retaining walls necessary for rice farming on these steep slopes. They built as well as they knew how, knowing they would never again leave this valley. They knew also that every following generation would continue the building, each adding its own contribution to the labours of those who had come before. The terraces climb up the mountain slopes, each stone set firmly in place with the knowledge that wild typhoons would surely come to try and shake it loose. For hundreds of years the building went on. Hundreds of years of father and son, mother and daughter, working side by side. Of course each worked to make a living, to feed themselves, but each also worked to pass on their farm in better condition to the next generation. For hundreds of years .... until now. The chain has been broken, and it is the wild pigs who now claim the inheritance. The generation who should be living here, who's children's voices should be echoing through the valley; they have chosen a different way. They have made a trade. Traded away their heritage, their history. Traded the hawks and trees and stream, for concrete apartments, supermarkets, cars, crowds, and noise, noise everywhere. Five years ago, when grandfather walked down the path on his way to the city, leaving his farm for the last time, did he turn back for one last look?Did he see in his mind the weeds that would come? Did he ask, "Why?" And did his heart break? Every summer I leave my apartment in the city and come and stand here in these fields. I look about me and note the changes; another tree blocking the path, a new hole in the roof of the farmhouse, another stone fallen from a wall .... And I ask myself, "Why am I allowing this to happen?" It is not grandfather who is to blame for this. 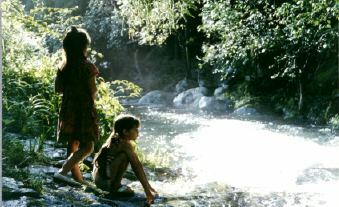 He spent his life productively here, and after his short stay in the city now sleeps in the earth in the village below. He played his part. It is I who am responsible. Every fallen stone lies in front of me in silent reproach. I turn my head, and pretend not to hear, but I cannot avoid the message. Each time I visit, the chorus of silent voices grows louder and more insistent .... Come back, they call. Come back. If I am to answer them it must be soon. Already, even in these five short years, a great deal of damage has been done, and in not too many more years, it will be too late. The typhoons will finish their work, and the wild pigs will have reclaimed what was taken from them so many, many years ago. I cried as I wrote these words tonight. Is there one among you so heartless that he does not cry as he reads them....?